The blonde secretary was scared when she visited Miranda Corbie's office. A shove into a streetcar track, a box of poisoned chocolates ... hateful, violent letters. Someone was trying to kill her. Miranda isn't sure of anything at first except that Louise Crowley, the blonde who works as an assistant to Niles Alexander, San Francisco publisher, is in trouble. Despite her own preparations for an imminent voyage to a blitzkrieged Britain and a painful farewell to the city she loves, Miranda decides to help Louise and takes on her last case as a private detective in San Francisco ... investigating her client, surveying the publishing world of 1940, and stumbling into murder with a trail that leads straight to Alcatraz ... an island city of sharks. With her characteristic luxurious, lyrical prose and insightful eye for character, Kelli Stanley paints a rich, authentic portrait of 1940 San Francisco in this latest installment of her award-winning series. An award-winning author of crime fiction, Kelli Stanley's first novel in the Miranda Corbie series, CITY OF DRAGONS, was met with overwhelming critical acclaim. It won the Macavity Award (Sue Feder Historical Mystery Award) and was a finalist for the prestigious Los Angeles Times Book Prize and the Shamus Award. CITY OF SECRETS, her second novel in the series, won the Golden Nugget Award for best mystery set in California. CITY OF GHOSTS was nominated for the Bruce Alexander Award, and CITY OF SHARKS will be released on March 20, 2018. Stanley also writes a highly-praised series set in Roman Britain, the latest of which is THE CURSE-MAKER. 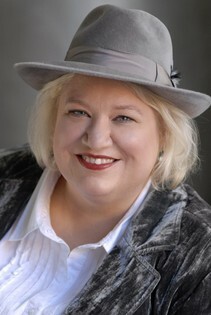 Her debut novel, NOX DORMIENDA, won the Bruce Alexander Award for best historical mystery of 2008. She makes her home in Dashiell Hammett's San Francisco, earned a Master's Degree in Classics, and loves jazz, old movies, fedoras, Art Deco and speakeasies.